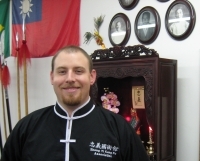 Wesley began studying martial arts in 2006 with the Platteville Aikido Club at the University of WI Platteville. In 2007 he moved to Madison and continued his training at Aikido of Madison adding training in Tenshin Shoden Katori Shinto Ryu swordsmanship. In 2008 he began studying Bei Shaolinquan at the Zhong Yi Kung Fu Association and has also studied Bajiquan with Instructor Lu Weijia. He is an Instructor with the Youth Shaolin program as well as an active member of the Lei Tai and Taolu competition teams. He has successfully competed at the USKSF international tournament in Baltimore MD as well as internationally, representing the US, at the World Championship Tournament in Germany and the Brazil International Kuoshu Championships in São Paulo, Brazil.